GSC2650A – WaterSaver Faucet Co. Application: Recessed safety center with barrier-free eye/face wash and shower safety station, matching fire extinguisher housing, ceiling mounted exposed shower head, and drain pan. Stainless steel cover provides attractive appearance and protects unit when not in use. When activated, cover serves as pan to collect waste water and return it into unit for drainage. 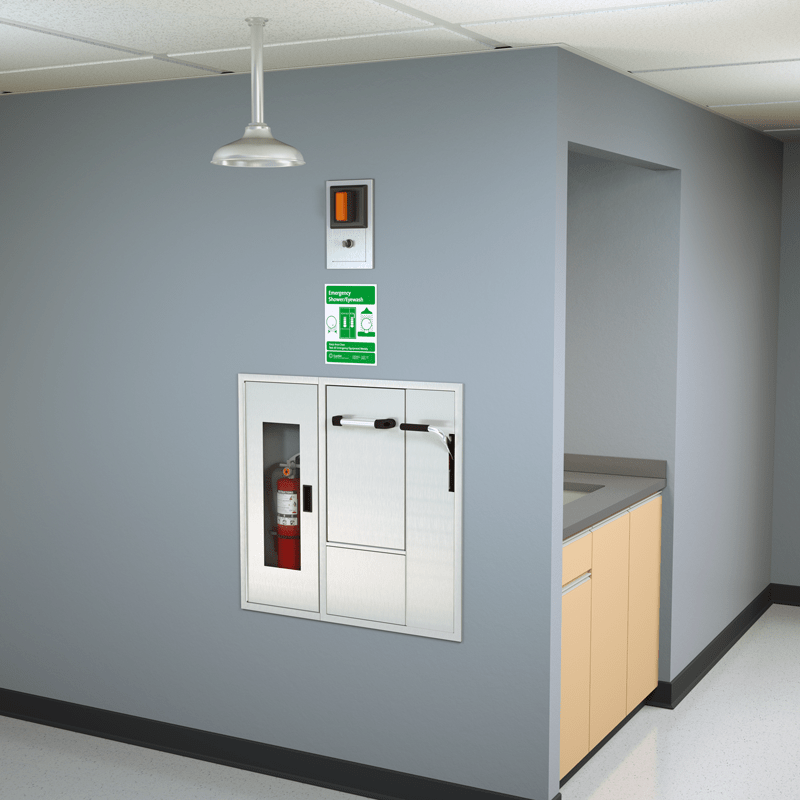 The integrated fire extinguisher housing creates a cohesive aesthetic for all safety equipment requirements in one location. ADA Compliance: When installed at recommended mounting heights, unit complies with ADA requirements for accessibility by handicapped persons. Shower Head: 10” diameter stainless steel with 20 GPM flow control. Shower Valve: 1” IPS brass stay-open ball valve with stainless steel “panic bar”. Pulling bar down activates shower; shower remains in operation until bar is returned to original closed position. Furnished with stainless steel access panel and 1” IPS unions for valve. Cover/Drain Pan: 16 gauge stainless steel combination cover and drain pan. Grasping “panic bar” handle and opening cover pulls spray head assembly down from vertical to horizontal position, activating water flow. While unit is in operation, waste water is collected in drain pan and returned into cabinet for drainage. Unit remains in operation until cover is returned to closed position. Eye/Face Wash Spray Head Assembly: Two FS-Plus™ spray heads mounted on supply arms. Each spray head has individually adjustable flow control and filter to remove impurities from water flow. Eye/Face Wash Valve: 1/2” IPS brass plug-type valve with O-ring seals. Furnished with in-line strainer to protect valve from debris and foreign matter. Mounting: Unit is comprised of (2) modular 16 gauge stainless steel cabinets. Each cabinet flange features 3/8” return for recessed mounting in wall. Supply: 1″ NPT female inlet. Waste: 2″ NPT female outlet. AP250-065 Modesty curtain for wall mounting. AP280-235 Electric strobe light and alarm horn unit for recess mounting in finished wall. Light illuminates and horn sounds when eye/face wash or shower is activated. Includes additional leads for remote monitoring. AP280-237 Electric strobe light and alarm horn unit with silencing switch for recess mounting in finished wall. Light illuminates and horn sounds when eye/face wash or shower is activated. Silencing switch can silence alarm horn during unit activation. Includes additional leads for remote monitoring. AP3800 Thermostatic mixing valve precisely blends hot and cold water to deliver tepid water as required by ANSI Z358.1-2014. Refer to “Tempering Valves” section for complete technical and product selection information.